Amy Bailey, the half-sister of GUNS N' ROSES lead singer Axl Rose, has urged fans via Facebook to watch ABC-TV's "Jimmy Kimmel Live!" show this coming Tuesday night (January 5). 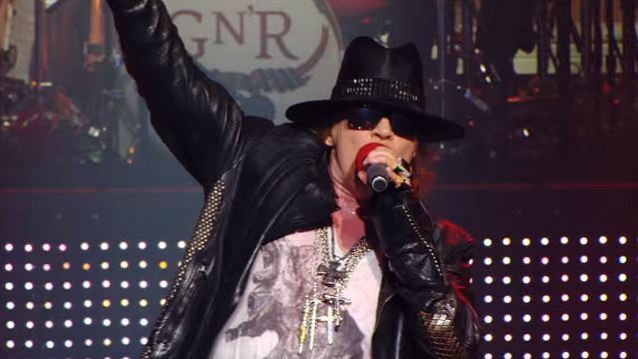 Axl is expected to make the GUNS N' ROSES reunion official with a "Kimmel" appearance on Tuesday. It's believed that GUNS N' ROSES will be revealed as one of the headliners for this year's Coachella Music And Arts Festival, of which the lineup will be announced earlier that day. Billboard.com reported on December 29 that GUNS has been confirmed to headline Coachella, which is scheduled to take place in mid-April in Indio, California. That show will reportedly be followed by a 25-date football stadium tour in North America next summer. Axl Rose, guitarist Slash and bassist Duff McKagan are all said to be involved, although it's not clear who else will be part of the band's lineup.